A battle is brewing over Collegeabacus.com, a website that aims to be the Kayak.com of college shopping by making it easier for students to compare prices at thousands of colleges. While some applaud the site for its ease of use and transparency, others say it is trying to profit from colleges' proprietary information -- and several schools have blocked it from accessing their prices. 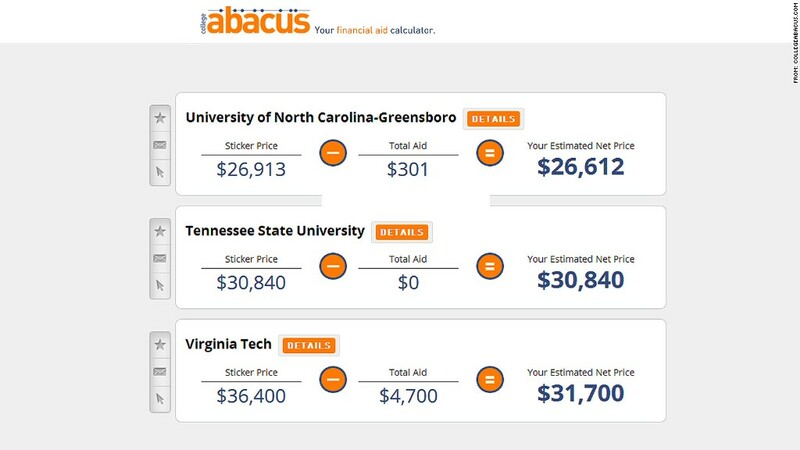 College Abacus launched its online tool in early October, enabling students to enter their financial and academic information and receive an estimate of their "net price," or how much they will pay (after scholarships), at thousands of colleges. Students receive their net price at any three colleges for free and can get as many comparisons as they like. For those who want to compare many colleges all at once, the site charges $100 for a spreadsheet of the top 200 colleges and universities. Just days after College Abacus' launched its site, Student Aid Services, a company that manages the net price calculators for about 700 colleges, began refusing the traffic that was coming from College Abacus' Internet Protocol address. Student Aid Services' clients had complained that College Abacus was taking their proprietary information without permission, and charging for it when the colleges provide it for free, according to company spokeswoman Mary Fallon. In addition, Fallon said the colleges worry that the site is providing inaccurate information in some cases, and might someday sell students' personal information. Several college officials have added that they fear College Abacus could entice students into simply choosing a college by price, without considering differences in quality of education. Peter Stace, vice president for enrollment at Fordham University, notes that students who use Fordham's net price calculator get information about the programs, professors and job opportunities that make the university's degrees valuable. They can also connect with a Fordham official to discuss special circumstances. "I want a chance to put the price in a context," he said. But yet another issue looms. Bill Carroll, a senior lecturer at Cornell's School of Hotel Administration and a travel industry pricing consultant, says that price aggregation tools, such as Kayak and Expedia, forced all but the most exclusive hotels to offer more competitive prices and could have the same impact on colleges. "Some institutions will not be happy," he said. Abigail Seldin, the 25-year-old Rhodes Scholar who founded the site, said she simply sought to help students more readily find colleges they could afford. Until College Abacus, students couldn't easily compare their own net college prices. The lists that were previously available listed only "sticker" prices (published charges for tuition, fees, room and board) or average net prices. Students had to spend anywhere from two to 20 minutes entering their family's financial information into each college's calculator. Price shopping, say, 10 colleges could take as much as 2 hours of tedious data entry. Seldin noted that last year, College Abacus won a $100,000 grant from the Gates Foundation-funded College Knowledge Challenge -- a competition to fund new web tools and apps to improve college access and completion. Seldin got the idea for College Abacus from her mother-in-law, Tori Haring-Smith, the president of Washington & Jefferson College in Washington, Pa., who complained about how hard it was for families to use net price calculators. And a growing number of colleges have asked to have their prices listed on College Abacus, including Student Aid Services' clients, such as Middlebury, Yale and Washington University of St. Louis. Seldin said she never planned on selling students' financial information, but she did initially consider selling their contact information as a way to try to recoup costs. She had even included information about that on her site. But she has since abandoned the plan, and said she will never sell students' information. She added that she has not received a single complaint from a college about any errors, but is happy to fix any brought to her attention. In a statement released Tuesday, the Department of Education said it is looking into the dispute over who can access colleges' net prices and efforts to make college cost comparisons easier. "We believe that correct and consistent information that is easy to find will make it easier for millions of students and their families to compare postsecondary institutions," the agency said.